You can’t judge a book by its cover but the book jacket and product packaging says a lot about the book, after all, it is the brand. Julius Caesar branded himself wearing a red cape in battle so that his men could easily pick him out of a crowd and see that he was not afraid. This was a savvy way to inspire courage and loyalty. Native Americans and Celtic Warriors often dawned body paint prior to battle. This physical appearance emanated their courage, strength and was a brilliant way to invoke psychological warfare against the enemy. NASCAR drivers view their cars as extensions of themselves – as a part of their persona. The car design is of most importance to them. A good paint scheme can help build the confidence of the driver and affect every member of a race team and at the same time use a form of psychological warfare on competing drivers. A bad paint scheme can do the opposite. The number 13 has been run at 411 races with 71 different drivers. It’s won only once when Johnny Rutherford won a Daytona qualifying race in 1963. The #3 however is no stranger to winning. It has a rich history of its whereabouts being tracked obsessively by competing drivers. Guys with the nicknames of Fireball and The Intimidator helped give the #3 its legendary status and put her in victory lane. At the marketing level, the purpose of a NASCAR car paint scheme, or its ‘livery,’ is to attract fans’ eyes to the car and therefore drawing attention to the car’s sponsor. 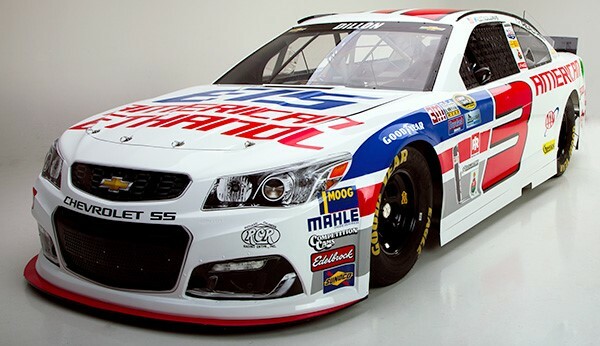 Since the car’s colors and theme are translated to the driver’s fire suits and caps, and often go on to help create additional branding opportunities for the sponsor, the paint scheme is of critical importance to sponsors, like American Ethanol. As a primary NASCAR team sponsor of the #3, American Ethanol works with NASCAR and the Richard Childress Racing team to carefully choose our paint scheme for certain races. As with all NASCAR sponsors the paint scheme can be instrumental in helping connect NASCAR fans with a branding proposition, and the same is true for American Ethanol where the fan can see key ethanol-related messages. After all, American Ethanol is one of the few teams that can showcase its brand logo and its product performance at the same time during a competition.